I managed to pick up the pace through June. I continued working on the interiors for the Alfa and Superbee. I also finished a significant amount of the work on the 66 Chevelle. The interior for the Alfa was easy to detail. I did have to fill in a sink mark on the dash but beyond that, most of the work was quick and easy. I used bare metal foil to trim the door panels. I used molotow chrome for the dashboard details. I finished the steering wheel and decided that I really wanted to open the holes in the spokes. I stripped the steering whee and used a pin vice to drill out the holes. To date, I haven’t finished the wheel. I also discovered that the dashboard catches the windshield frame of the body. The glass attaches from the outside which should prevent any fitment issues but I will shave the dash and respray it at a later date. The interior for the Superbee was relatively simple. I stripped the chrome center console and painted it woodgrain. I followed up by painting the trim with molotow chrome. I also painted the shift knob woodgrain. In order to prevent the steering wheel from sitting in the driver’s seat, I had to bend it back significantly. It’s not 100% but looks more accurate. The main effort this month went to the 66 Chevelle. I finished all of the interior detail and assembly. I also prepped and sprayed the body in color and clear. I’d like to say that I can hammer out the Chevelle in the next month but I never received the LS engine that I ordered from Clearly Scale. I finished the detail work on the Alfa’s interior and was ready to start assembly. I assembled all of the interior parts except for the steering wheel. I decided to drill the holes in the spokes and started by stripping the paint. I staged a few random parts from several projects. Check out those Z28 wheels! 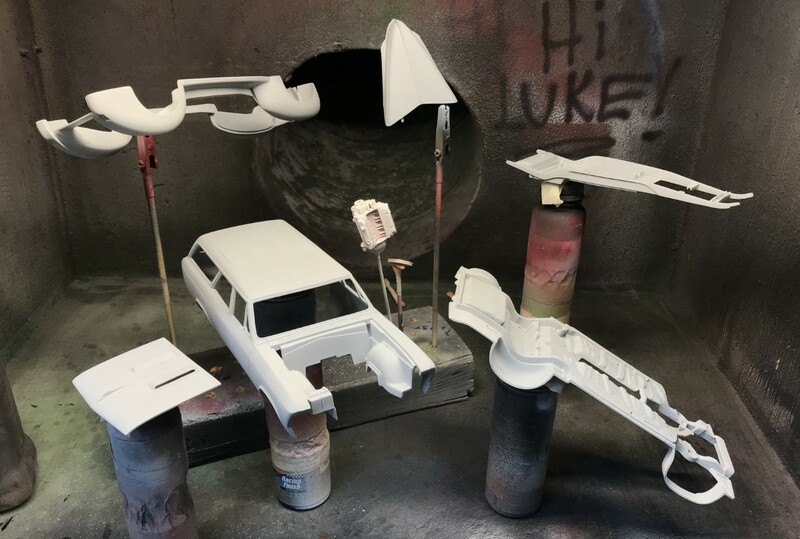 I dove into preparing the interior for the Chevelle by priming all of the parts. I wanted red accents and chose to spray that color first. Once sprayed, I needed to mask the area that needed to stay red. Once I sprayed the interior with gray, I sealed the paint with Tamiya semigloss clear. Once dry, I flocked the interior. The Chevelle’s door panels provided great opportunity for detail painting. I hand painted the arm rests. I used bare metal foil for the lines and Molotow for the cranks and handles. Other than the shifter, the interior is complete. The interior for the Chevelle looks great! I finished prepping the body for the Chevelle and primed all of the parts. The 40 Ford slipped in for primer to check the body work. After touching up the door sills with gray and clear, attaching the shifter and horn button decal, the interior for the Chevelle is complete. Light sanding the 40 Ford’s body reveals more imperfections in the surface. Prior to painting the body in Titanium Silver, I sprayed a base coat of Tamiya gloss aluminum. I had to abandon the decanted paint while spraying this body! I could not avoid tiger stripes with this color. Once I started spraying with the can, the paint was smooth and even. Bits and pieces getting attention. No, not yet. There are still a few stubborn issues that need to be resolved. Sneaking in behind the Chevelle interior is the Superbee’s interior. I finished it by attaching the center console, shifter and dashboard. June was busy and I’m happy with my progress.